I have been on the hunt for an all-around watch rugged enough for the woods but still stylish enough for the rest of the time. Waterproof, and tough were a minimum. There are countless features available on rugged outdoor timepieces in today's marketplace. Everything from digital compasses and GPS to Altimeters and thermometers, watches have become more about everything they can do except tell time. I just wanted a watch that would keep perfect time and be able to survive anything I threw at it. Timex watches has had this very reputation for as long as I can remember. They "take a licking and keep on ticking", right? 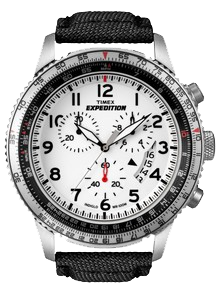 I have been wearing the Timex Expedition Military Chronograph for the better part of the summer and I can not break this thing. I have done everything except crush it with a hammer and it reads exactly the same as the Atomic Clock I set it against back in June. Still not impressed? Well, here is a brief list of the things I have done to this watch in an effort to make it fail. 3) Dropped it from 15 feet to a hard-packed ground surface. 5) Let my 3-year old daughter play with it, usually the end of anything worth more than a pack of gum. Now, Timex has a whole line-up of watches with the bells and whistles, so if that's what you want look HERE. I love this watch for the fact that it does just a few things incredibly well. As I said, It keeps perfect time. It also has a Chronograph (stopwatch) to a 1/20th of a second, a date feature so I know what day it is and the infamous Timex Indiglo back light. After all the abuse I have given this watch there are only a few signs of wear. A few busted stitches on the Cordura strap, some of the paint has been scuffed off the bezel and a little scratch on the side of the case, but that's it. Not a mark can be found on the crystal, nor have any of the buttons had any issues.